Well, who hasn’t? Surely Big T and Papa Jo would have recognized Berry’s roots in the blues, and seeing the spirited buck and wing that a poplin-suited gent cuts while Chuck sings his ode to the girl “in tight dress and lipstick” underscores how much his music was rooted in the same vernacular as jazz. 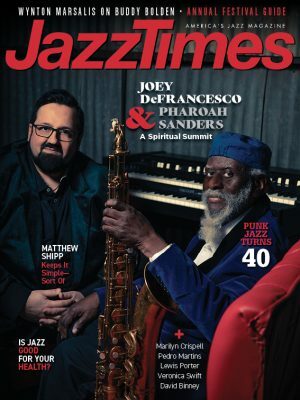 But in this case, one man’s vision may be another’s slippery slope, and the apparently irreversible trend we’ve seen in de-emphasizing jazz at so-called jazz fests began at Newport on July 6, 1958. Newport fests went on to feature major rock acts in the ’60’s and early ’70’s; I was present on Friday night and Saturday afternoon of the ’71 fest, but felt the vibes and got on the road before a storming of the gates during Dionne Warwick’s evening set shut the festival down and sent it looking for a new home. A pleasing reversal of Wein’s “capitulation” is that the festival he re-established at Fort Adams State Park in Newport in the 80’s is a jazz purist’s delight, and a big draw. Notwithstanding this bitter memory, Wein praised the film. “The technical aspect was sensational, and the color photography was striking,” he wrote. “This sort of documentary was still a new thing in 1958, and jazz had never been presented this way on screen before.” Indeed, Stern’s “impression of jazz was…something downstairs in a dark room. This [movie] brought jazz out into the sun and it was different,” the filmmaker reflected. Actually, “into the sun” had been Wein’s doing with the creation of the Newport Jazz Festival in 1954, but credit Stern with immortalizing the images of these artists whom Duke Ellington called “night creatures” in glorious living color.